Musically speaking, SysCaster™ is our Opus 4 offering. What started out back in 1995 to manage what makes a PC work has really come a long way. In reality, it seems either the extreme left nor the extreme right is the correct way to manage PC based IT systems. At the one side is the extreme chaos of everyone needing to be their own IT administrator. That is after all, how most of the world deals with their PC based technology. At the other extreme, there are those that take math and science to the utter extreme and make them the law. That is not a good point to end up in either. At either extreme, you would never arrive at a System Management system which deeply covers the entire list of topics in the following table, but to truly, successfully, accurately administer an entire IT system everything in the table is a vital component. "The Truth Is In The Logs"
The missing link: The technology itself is the missing link in managing IT systems. No one really cares about it, but everyone is forced to rely on it. There in lies the root of failure for the majority of IT system faults. Everyone wants to run the business software - be it ERP, email, or E-Commerce... everyone just wants to mess around with the high level applications. Well, everything is built on some sort of a foundation. Happen to think about your IT system's foundation lately? Ever? Did you know that with the proper foundation, most IT system failures can be eliminated? Is it maybe time to think a little bit more about that IT system foundation then? We think so. All right, so there is a lot which goes into an IT system - it takes a bit complex foundation to have an IT system these days. One way or the other, you make choices and decisions about your IT system foundation. Most folks simply blow by 99% of those road signs and just take all default settings. Vendors typically try to design things so that what ever it is you are trying to do will do what it is suppose to do immediately using all default settings... just do not count on those default settings all being hacker proof, fault tolerant, or other important but generally overlooked virtues. So as we set out over the years to invent technology which will best manage what this IT system foundation part wants to keep it working at top performance. Quite a variety of sub-disciplines of IT system administration emerged, and as a result a wide variety of functions the IT system management software must perform in order to maintain the IT system. This software is being specifically designed to be best-of-breed in the ESD market and be heavily focused on automating "Solution Based Computing" environments. Where other tools focus on aiding in the recovery of common failures or points of inefficiency in administering computers using traditional methods, this software is focused on using the most efficient means of deploying and maintaining IT solutions. One key technical aspect that sets SysCaster™ apart in the ESD software market is that it uses an "End-State" Management model. With this operating model, SysCaster™ computes a desired "End-State" for each computer it manages. That "End-State" is comprised of the operating system, applications, updates, patches, configurations, policies, and so forth. All other methods of ESD are unable to completely address conflicts between multiple pieces of software as they allow each software's installer to do what it desires. "End-State" Management is also responsible for capabilities some ESD products call "Self-Healing" where the ESD system is able to resolve application failures simply by restoring the computer back to the desired "End-State" - having all of the correct files and configurations. When the goal is to deliver "Computing That Just Plain Works," then there is no alternative than to utilize the capabilities of "End-State" Management within the design of the ESD system. As SysCaster™ must be installed on each computer, it manages itself as mere components of the "End-State" being computed. Commonly ESD technology is not able to manage itself across the IT industry requiring supplemental procedures / technologies to "manage the manager" so to speak. "End-State" Management Accelerator - In addition to "End-State" Management being so rare in IT industry, LFSF is going to further its competitive advantage by greatly reducing the time required to compute the "End-State" model during each ESD cycle. This will be accomplished by developing the model in a jig-saw puzzle-like manner which allows components to be added, changed, or removed without having to recompute the entire model. Conflicts identified while adding/changing/removing components in the model are remembered and then resolved at the end of computing the "End-State" model. The current model will be saved on the client computer after each ESD cycle. The Pre/Post Scan Packaging tools will utilize intuitive operations to perform the technical details of software packaging. Pre/Post Scan Packaging is the process of detecting individual resources added/changed/deleted on a computer during installation of a software application. As software packaging is about putting the correct files in the correct places, the interface will use similar interfaces to traditional file and registry tools such as Windows Explorer and RegEdit. Detail grid views will allow administrators to view multiple attributes for multiple files at a time, and quickly make changes to those settings through the grid interface. Queries and filters for search criteria will limit the number of individual resources shown. Integration with Knowledge Management Module - The software will track the cleanup steps performed, and include intelligence to learn what types of things need to be cleaned up, thus increasing productivity the more the tool is used. The steps performed during the cleanup process are saved to a macro. When subsequent software packaging tasks include a resource which was manually adjusted in the previous packaging task, the software suggests the previous adjustment in this new instance. Macro capabilities will be developed into the packaging tool allowing the steps to prepare the captured software resources into a finished package. This will allow the manual labor steps to be captured and then replayed by other administrators packaging the same software. Upon running the saved macro, it then compares the current package with the results remembered in the macro and points out differences between the two packages. Integration with Change Management Module - Using the macro created during the cleanup process, Change Management provides capabilities to undo undesirable changes without having to completely start over. In addition to the previously described cleanup tools, the conflict resolution tool will compare one or multiple packages to all of the software packages in the SysCaster™ environment. This allows administrators to see and decide how to handle conflicts between packages prior to deploying the software. For software applications which do not have their own installer, such as custom developed software, there is no need to rely on Pre/Post Scan detection of the resources associated with the software application. The import feature of the packaging tool provides a direct link from popular version control systems and also the native file system. The custom protocol will allow SysCaster™ to more gracefully and efficiently respond to network interruptions. Security and access to resources stored in the repositories will be greatly enhanced allowing the ESD clients access to only individual resources they are entitled to. Storage of software package resources on an individual basis. This level of granularity guarantees that only changed resources are broadcasted across the network to each stager. Facilitates the Hybrid Mode for Microsoft Installer (MSI) packaged applications. Removes the dependency for the Samba software and for Microsoft File and Printer sharing to be even enabled on the computers being managed. Microsoft Installer (MSI) Hybrid Mode - Some applications have been developed in such a way that they communicate with MSI during operation. This means that repackaging these applications with Pre/Post Scan technology will fail as useless MSI references would be tossed out. In this case, SysCaster™ will provide a hybrid mode of operation which causes MSI on the target computer to connect back to SysCaster™ to receive the resources it requires to deploy/verify/remove the application software. As applications are packaged in SysCaster™, the administrator defines policies of what things to include in workstation backups so that no application settings or data files are ever lost. Address books, web browser bookmarks, data files, the list goes on and on... finally identified and specifically protected. No lost productivity. Computers are able to be defined in SysCaster™ as a client/stager where it will only stage for itself. This facilitates SysCaster™ to operate while disconnected from the office network. The first operation SysCaster™ conducts when configured in this way is to attempt to locate a SysCaster™ server to replicate from. This replication could be interrupted if the computer should need to be shut down immediately, and would resume from the point it left off in the replication process. The second operation for SysCaster™ is to conduct a normal ESD connection, managing the software entitled to that computer. In this Advanced Mobile Computing mode, SysCaster™ is able to recover application failures while totally disconnected from any network connection utilizing the resources previously replicated to the computer. "Slow network mode" - willing to receive security updates over a slow dial-up connection and wish those to be installed. Going one step further... An industry first: "The Totally Off-Network Workstation Reload!" Picture in your mind a sales person in their hotel room preparing for a critical meeting the next day. Something goes wrong with their laptop computer - maybe Windows is sick, the registry becomes corrupted. In short, the operating system has become so corrupted that maybe it no longer starts up completely. Instead of being stuck, SysCaster™ allows them to initiate the normal workstation reload process while disconnected from the network. Every single software update which had been successfully replicated to this system while on the network will be maintained while off of the network. Upon completion of this process, the computer is restored back in working condition and the data files are left intact. Eliminates software license fraud - The SysCaster™ environment will not allow clients to distribute the software to more computers than they own licenses for. Software activation and serial number schemes become obsolete. SysCaster™ will replicate back to the vendor detailed logs of the ESD processes associated with deploying their software. That allows their technical support staff to knowledgeably assist clients as they have detailed logs about the integrity of their software on the computer in question. Software is received by them directly into their SysCaster™ infrastructure allowing them to move directly into Qualification Process and entitlement to target computers. Updates to the software are handled through the Change Management and Qualification Process. Administrators know exactly when vendors make updates, what they updated, and if an update ultimately does not work for the client they are able to roll back their production environment to a previous version. "Emergency Push" the change (rollback) out to production computers. Integration with Service Management Module - Administrators define hardware and software selections which should appear on the computer setup form. This tightly integrates with service requests with standards set by the organization. This module is focused on extracting knowledge out of tasks performed in business processes and make finding relevant knowledge efficient. Within the SysCaster™ environment, a context sensitive menu choice allows users to create KM entries which automatically remember the context in which they were created. Context often is a way people recall remembering something, and by automatically associating context with the entry, it becomes searchable criteria. For example, someone working with the Software Management module discovers the purpose of a specific file, registry entry, or another detail. They are able to create a KM entry directly associated with that resource. A related feature to Contextually Creating KM Entries is the ability to migrate a work ticket to be a KM entry. The context captured it details of the original ticket in the Service Management module, but this new entry in the KM system remains even beyond purging of old Service Management tickets. The process of migrating the ticket to be a KM entry allows the person committing to reduce the entire ticket down to the concise content which is truly knowledge. In the Software Management module, software version numbers are not always as simple as 1, 2, 3... This capability allows administrators to define a specific version order for a specific resource which SysCaster™ will utilize for only that resource. Also in the Software Management module, some resources require special handling. The details of the special handling required is captured by the KM module so that subsequent encounters of the same resource will automatically offer the previously remembered details. As previously documented, macros which automate cleanup steps during software packaging are stored in the KM module. This module provides an integrated ticket-based work tracking system allowing the entire IT organization to work together efficiently, appearing to their clients as a well optimized team. One of the basic components of the Service Management module are Work Tickets. One of these is created for each work request, and will have attached to is various detail tickets which are dependencies of accomplishing the task originally requested. Asset Management automatically generates a Work Ticket based on the forthcoming retirement / replacement of this computer. A support representative visits the client to verify their continued requirements for their computer. They complete a Computer Setup Form based on their visit. Someone in Policy Management receives the Computer Setup Form to define the proper configuration for the replacement computer. While reviewing the information provided, they see that a new piece of software has been requested and also that a Token Ring to Ethernet conversion is being conducted in the work location. They attach a Package Software Form and a Convert LAN form. Someone in Software Management receives the Package Software Form and while reviewing it decides that it is actually two pieces of software which will be packaged. The form is then duplicated and properly documented as to the two specific things being packaged. They set their deadline ahead of the actual computer replacement date allowing for the certification process of the new software package to take place. The network wiring team receives the LAN drop conversion request and schedules someone to convert the drop the same day as the new computer is to be delivered. Once all of the work has been completed, all supporting tickets as well as the main Work Ticket are closed. By attaching multiple sub-tickets to a main ticket, the specific portions of the entire request may be assigned to the person / team responsible for them allowing the teams to work together at the same time. Multiple Work Queues may be defined which correlate with departments / job functions within the IT organization. Each queue has default Service Level Agreement settings associated with the various types of tickets supported by the Service Management module. For queues with multiple team members, tickets are able to be assigned to specific team members and their tickets show up in their personal queue view by order of importance. In the Work Management view, Work Queue administrators are able to review assigned tickets along with due dates, quickly identifying when special handling / adjustments are required. This module provides capabilities for purchase handling of assets, assignments, and remote inventory scans of computers managed by SysCaster™. During the Software Management ESD cycles, the SWM client conducts a hardware and software inventory scan of the computer. This scan is transmitted upwards through the SWM Stager infrastructure back to the Manager where it is submitted to the Asset Management Inventory Scan database. This provides the "as-build" analysis of each computer. It helps identify software which has inappropriately been installed by someone and hardware which has been removed from the computer. This database tracks all purchases of both hardware and software. These assets are then assigned to specific users, and the history of assignments for each asset is maintained in this database. These functions facilitate the Purchase Order process and procurement of assets from vendors. Standard products, descriptions, pricing, and supplying vendors are able to be organized and are utilized to quickly produce quotation request and purchase order documents. These documents may be attached to Work Tickets in the case that fulfilling a Work Ticket is depending on an order being received. SysCaster™ Network Management - OpenNMS is a GPL licensed OSS/FS Network Management Platform. 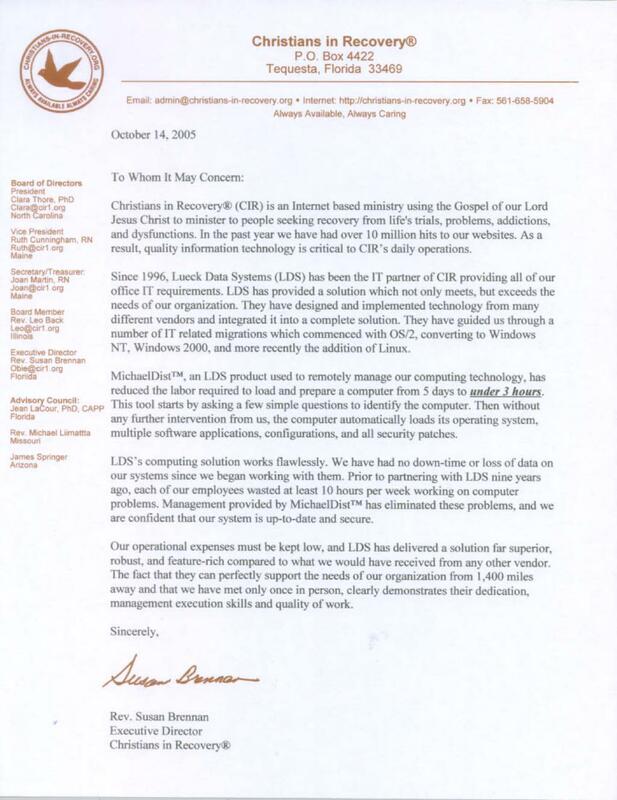 LDS intends to build a link between OpenNMS and SysCaster™. One of the first integrations proposed is the ability to create a Service Management Work Ticket based on OpenNMS generating an alarm based on a pre-defined network event. This integration prevents a network administrator from needing to manually create the Work Ticket, document the captured details, and assign the ticket to the appropriate team. When the correct team member responds to the network event, they already have an accompanying Work Ticket in their queue where they are able to document their revolution to the problem. SysCaster™ will be developed so that OpenNMS is able to communicate with the Manager and Stager modules to monitor the health of these infrastructure components. Upon encountering an error condition, OpenNMS will generate an alert so that proper support persons may be notified. Capabilities will exist to monitor the number of errors the Software Management module is experiencing during the scheduled ESD cycles, and an alert could be triggered if a specified threshold is reached. This would allow for administrators to correct the error and restart the ESD cycle before their window of time for the ESD cycle has elapsed. SysCaster™ contains a lot of information. This common functionality module facilitates searching through and linking together information stored in each module. How many computers at this site? How many computers at this site with this software? How many computers with this video card and this operating system? How many computers with this software and that software? How many computers with this software but not that software? How many computers have not run an ESD cycle since ___ ? How many computers have not received a specific update to a specific application? During the past three ESD cycles, this computer needed this file repaired, why? The list is endless... and this module quickly locates the answers! Any report defined in this module may be scheduled to run at specific time(s) and for the resulting report to be delivered via a number of methods. This allows routine reports to be automatically be prepared and delivered without user intervention. This common functionality module is responsible for providing a Qualification Process and Version Control System to all areas of the SysCaster™ product. Often in the IT industry, software is not developed in such a way as to allow changes to be tested prior to their implementation in a production environment. Additionally, no way was made to back out a change which is found to not be desirable. Finally, the ability to audit activities done in the software is non-existent. Administering IT systems without these capabilities is like literally driving a car with a broken speedometer and door which will not stay shut. Having these "common sense safety capabilities" within SysCaster™ immediately sets it apart in a positive way. All changes made in the SysCaster™ environment are tracked by this module. Viewing of the data is possible in both sequentially showing all edits to all objects and object specific showing edits made to only a specific object. A specific application package in SysCaster™ is comprised of a series chain of resource groupings called packages. Computers are entitled to a specific version of an application, for example the Production or Development version. In order for an additional package to become part of the chain referenced by a specific version, the correct certification and approval attributes must be present on that package. This technology also allows for a package to be uncertified should a defect be found after certification was granted. The environment requires that the certification for a previous stage of the qualification process is in place for the next stage of the qualification process to allow moving to the newer package / build of the application. This module is also a common functionality module responsible for all aspects of administering User Accounts, Roles, Permissions in both the SysCaster™ environment and other IT systems. It works in harmony with the Change Management module utilizing the functionality of that module for its operations. Within SysCaster™, fine granularity of assigning the correct capabilities with individual users of the environment is necessary considering the diverse types of job roles which will be using the various SysCaster™ modules. Additionally, through the Software Management module, this module becomes a Policy / Security Management administrative point for other technologies within the complete IT system. Examples of this would be in the management of user accounts on workstations and servers offering file and printing capabilities, also the roles and policies for those accounts. Software entitlement, policy, and configuration management is another area where SysCaster™ will stand out. SWM tools are not complete without providing a solution to this giant task. The SWM system must be able to deliver a computer which is immediately ready for use after it has connected to the SWM system to have the operating system and applications installed. Thus, this area of the SWM system must allow for each computer to have the correct applications entitled to it, and the correct variable settings to be defined for that computer. (Such as user ID, mainframe terminal ID, client/server communication gateway, etc...) Common tasks and features like phased roll-outs, bulk/batch changes, hierarchical group inheritance, dependencies, version control all need to be addressed.